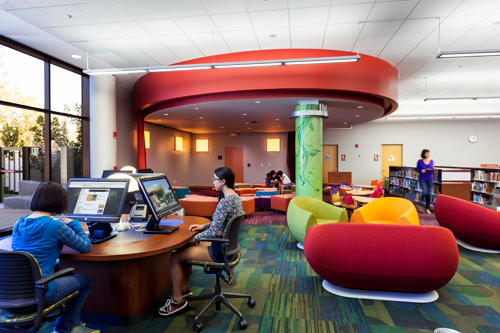 All branches of the Palo Alto City Library offer free Wi-Fi to users with a wireless-enabled device. All libraries have public PCs available on a first-come, first-served basis. Cardholders: use your library card to log in. The limit is 60-minute sessions, and up to 3 hours per day. Guests: a 30-minute visitor pass per day per guest. An open desk space with one Creative Tools Laptop designed to support and encourage self-guided learning, production and creation of digital media at the Downtown Library. Reservation of this space is to be used in conjunction with the Creative Tools Laptop only. Users of the public PCs, the loaner laptops, the creative tools laptop and Wi-Fi agree to abide by the Library's Internet Use Policy. Available for 7-day checkout with a library card for library card holders age 14 and older. Check out the availability in our catalog. First come, first serve. Loaner laptops are available for 2-hour use at all branches with the exception of Children's Library. What material is used in the library’s 3D printers? Why is the Palo Alto City Library offering 3D Printing? Appointments are always full. How can I get an appointment?